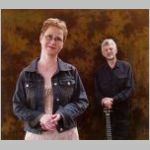 Chris is a great singer of English folk who's also a superb guitarist and a club favourite. He is joined by his wife Bara who is ranked as one of the top singers in the Icelandic tradition. For a flavour of this Duo checkout their Myspace site. http://www.myspace.com/funireykjavik.